On one of the three days I explored Amsterdam, I went for a walk with a few places in mind to visit. One of them was the Amsterdam Library and the other was an island (that I had no clue where it was located) with unique modern architecture. I set off on my adventure, asking people along the way for directions. First, I passed the Science Center NEMO for children….you can’t see it in this picture, but they grow grass and bushes on the sloped side and people are walking on it! When you cross this bridge, the view is cool! This photo is out of sequence, but I thought it was cute…the girl having her photo taken by her boyfriend! Here are another couple of canal pics I couldn’t resist putting up…. 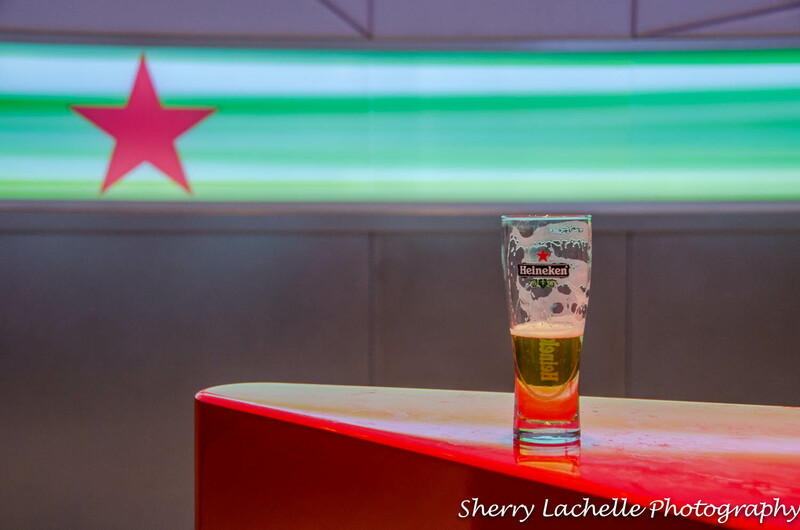 The Heineken Experience in Amsterdam is interesting. I think they could make it better if they let you start drinking from the beginning and if you’re tired of walking, like a lot of tourists, make it more like an amusement park ride, where you sit down and it takes you through each room! 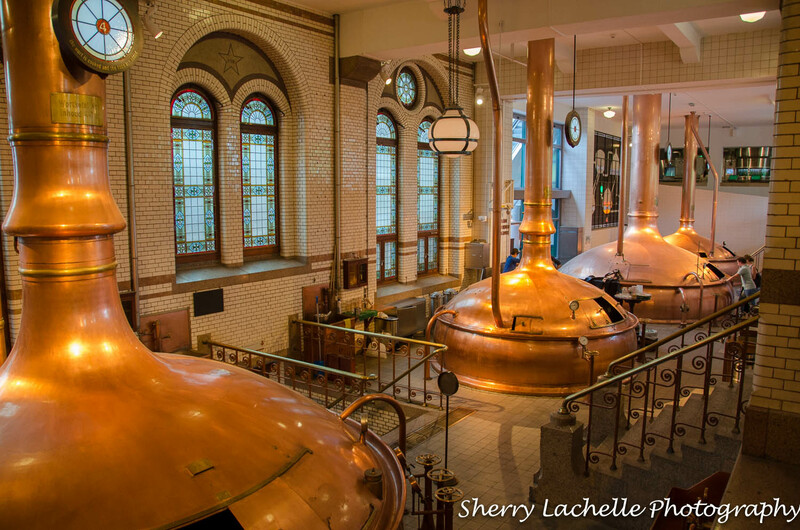 Anyway, first, you walk through a number of rooms with interactive displays and historical things to read and a cute girl that gives you the background of beer making…mixing barley, hops, water and yeast. Anyway, eventually you make your way to the tasting room…then more displays…then finally you get two small beers at the end, where it’s really crowded and there’s a huge line for the beer. 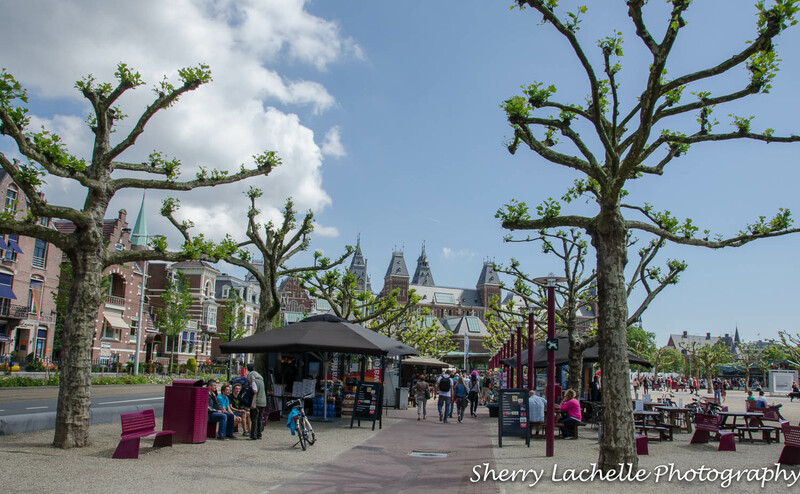 The area in Amsterdam known as the Museum Quarter or District is beautiful! I just happened upon it while racing from Vondelpark to meet my friends at The Heineken Experience. If you want culture, then this is the place! 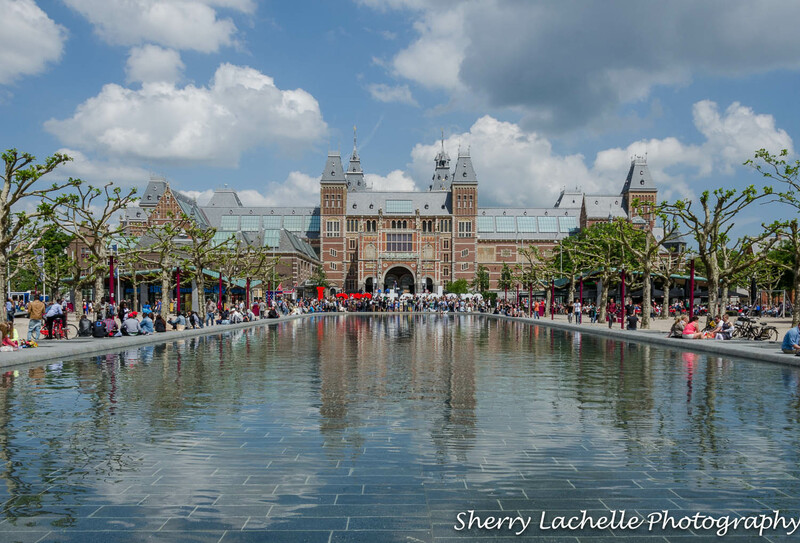 The Rijkmuseum, Van Gogh Museum, Stedelijk Museum, and Concertgebouw (Concert Hall) are located in this area. Straight ahead in this photograph you’ll notice the iAmsterdam in red and white. People were sitting on the letters and some even climbing! One quick story…while running to get on a Metro going somewhere (can’t remember where because I went through ten Cities in 27 days…that’s a lotta trains/and I guess it really doesn’t matter where for the story), just as I made it in before the doors shut and was jockeying for space, a lady with a large grocery bag and her two children with scooters were right behind me, unbeknownst to me. The doors shut on her, the kids fall over onto their scooters like dominoes, they start screaming and crying and luckily the doors open and the lady squeezes in. I was trying to help the children up, but was so tightly crammed in, I couldn’t bend over. That wasn’t fun. In the late morning, the chill long gone, I traipsed through Amsterdam’s revered urban park…Vondelpark, observing the palette of greens generated by the shafts of sunlight. Vondelpark reminds me of Central Park in New York City. There were lots of people out jogging, walking, and bicycling…enjoying the weekend! 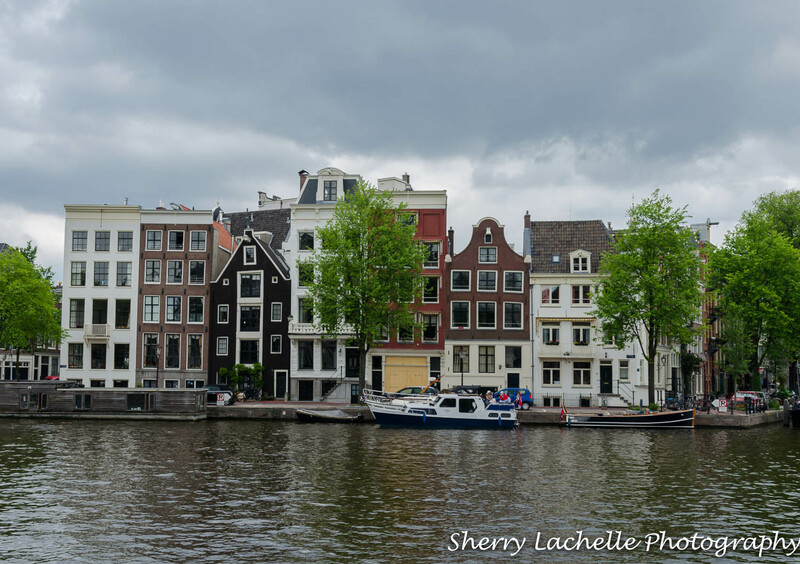 I left off yesterday having arriving in Amsterdam by overnight train from Munich for a three-day visit and promised I would share with you some of the beautiful canals that so generously weave their magic through the City! I also mentioned how Amsterdam is one of my favorite European Cities. 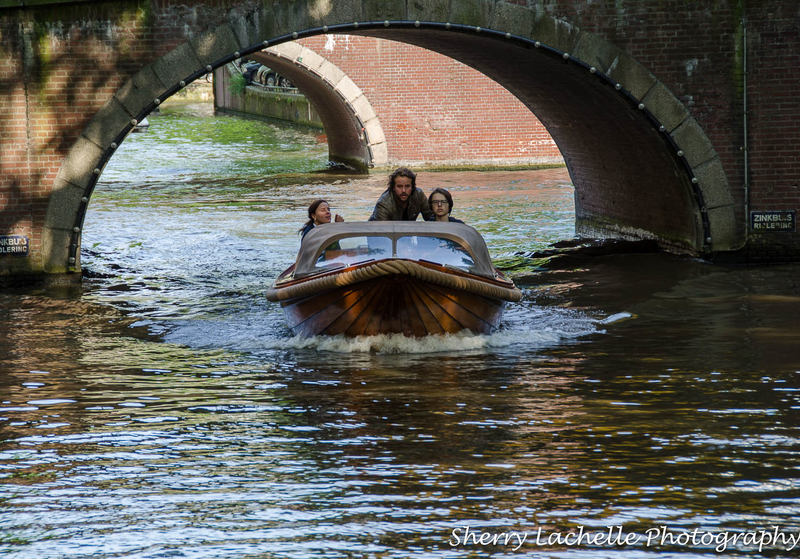 The architecture, canals, culture and laid-back vibe merge to create an atmosphere that to me, is quite special! I had so much fun taking the metro or trams and walking around the City to see as much as I could in the limited time I had. My friend and I arrived to Amsterdam‘s Central Train Station just before 9am on May 30th, following a not so comfortable overnight train ride from Munich. I’ve taken overnight trains in Egypt and Portugal and I have to say this was the least comfortable. I’m sure my friend, Richard, can’t get comfortable in many beds because he’s 6’7″ tall, but it was also quite noisy throughout the night and when I would wake, I was being tossed to and fro. Enough complaining! We bought our 72 hour transport card and followed the Google Map directions I had printed off leading us to the Metro line that would deposit us less than a half mile from the Airbnb I had rented for our 3 night stay in Amsterdam. Upon arrival to the Apartment, we were shown around by the owner, and once she left we settled in. It is situated on a canal and had everything we needed. We were especially thankful for the washer and dryer, which we put to immediate use! Having traveled in Southeast Asia, six countries in Africa, and other developing Countries, and experienced the organized chaos associated with a multitude of bicycles, I was surprised by this in Amsterdam, along with absent helmets on most children and adults, and the legality of motorcycles on bicycle lanes. There’s nothing like biking along and suddenly feeling the air whoosh by from a large motorcycle within inches of your handlebars!